Why have you placed Adam and Eve in the lower regions of Mesopotamia? Scientists seem to agree that the Fertile Crescent was where civilization rose up, where wheat was planted for the first time, and where cities were established. I know the Genesis account has Cain building a city and naming it after his son Enoch. So, Mesopotamia is where I placed my Adam and Eve characters, after their “fall” in the Garden. Indeed, if you look closely at Genesis 4:17-22, within several generations of Adam and Eve’s family, there were skilled artisans working in musical instruments and bronze and iron, something that in history books takes eons of years to accomplish. History students will balk at how I’ve combined the Ubaid (4000-3500 BCE) and Uruk ( 3500-3000 BCE) and Jemdet Nasr (3000-2900 BCE) periods of civilization, based on developments in architecture, writing, seals, metalworking, and pottery. For this, I apologize, but since so much is undecided about when and where things came from, I took a smidgen of literary license. What we do know, so far, is that originally there was no precious stone or timber or metal in the lower Mesopotamian regions. These things had to be imported from the north, either by land or by keleks or boats sailing down the Euphrates and Tigris Rivers. How did you decide on Sumerian culture for the city people? I came upon the Sumerian’s fascinating culture—at the Ancient Near Eastern Art Exhibit in the Metropolitan Museum of Art and in Susan Pollock’s Ancient Mesopotamia and Karen Rhea Nemet-Nejat’s Daily Life in Ancient Mesopotamia and Jean Bottéro’s Everyday Life in Ancient Mesopotamia (translated by Antonia Nevill) and Leonard Cottrell’s The Quest for Sumer and Denise Schmandt-Besserat’s edited lectures in a volume called The Legacy of Sumer. Absolutely delightful was Samuel Noah Kramer’s History Begins at Sumer. Readers might be interested in the Sumerian CD collection from California Museum of Ancient Art—talks given by Dr. Samuel Noah Kramer, Dr. Wolfgang Heimpel, and Dr. William Fulco—on everything from astronomy to Inanna to shepherds. Although I do not call my city people Sumerians, they carry numerous similarities. Based on the references in Genesis 4 to metal making and the playing of the lyre and the pipe–also the generational lists in Genesis–I felt that it seemed right to put Adam and Eve in Mesopotamia about the same time as the Sumerians. Didn’t everyone speak the same language until the Tower of Babel? Here, I quote from Carol Hill’s article “A Time and a Place for Noah” (PSCF 53.1 (March 2001): 24-40.) “The possibility that before ca. 2500 B.C. all of Mesopotamia spoke one language (Sumerian) may have been the foundation for the statement found in Gen. 11:1: And the whole earth was of one language and one speech. After about 2500 B.C. (or about the time of Peleg and the tower of Babel), other languages such as Old Akkadian and Old Babylonian (Semitic languages), “overtook” the ancient Sumerian, and by 2000 B.C., it had become dead as a spoken language. The oldest historical indications of the Semitic language in Mesopotamia are the names of the scribes found in the archives of Fara (Shuruppak) and Tell Abu Salabikh, dated to ca. 2600-2500 B.C.” I, of course, have Adam and Eve speaking differently from my Sumerian-like people, because in my novel, they hail from the mountainous area above the plains. How could you possibly know the cuisine of ancient peoples? Amazingly enough, the crops and cuisine of the Mesopotamian region today—present-day Iraq—are similar to what they were back in ancient times. I consulted two fine books—one scientific, the other contemporary—on Mesopotamian eating habits. The first was Jean Bottéro’s The Oldest Cuisine in the World: Cooking in Mesopotamia (translated by Teresa Lavender Fagan) and the second was Nawal Nasrallah’s Delights from the Garden of Eden: A Cookbook and a History of the Iraqi Cuisine. Explain this whole cuneiform writing thingamajig. Cuneiform writing was introduced by the Sumerians. It began as simple symbols for objects, etched into wet clay with a reed stylus. Later, the symbols were transformed into more elaborate drawings that could substitute for a situation or a phrase. Often, these drawings can only be translated in context. Priest-scribes were the ones who usually taught cuneiform in the schools, but overall, cuneiform writing was used for business transactions and archival records and storytelling. Dara learns the most primitive of this cuneiform, when one might be able to guess, immediately, what the picture stands for. Later cuneiform has to be compared to other texts of the same time period to guess at what the scribe is saying. Did the Sumerians really know all that stuff about the stars and moon and years and days? Tentative in my usage of the elements of time, day and year, I was astonished to discover that the Sumerians had already figured out the patterns of the months and seasons. In following the moon’s phases, they were continually short about eleven and three-quarters of a day, so they adjusted their “lunar year calendar” to account for lost time. I refer to the day and night cycle being like our own, but to the Mesopotamians, the day cycle began at sunset. A day lasted from sunset to sunset. How could you possibly know how people talked back then? I don’t. I just took a stab in the dark. I fell back on the fact that even historians have difficulty deciphering Sumerian cuneiform texts. I did not want the language to be jolting or archaic in any way. I did not want my reader to stumble upon the prose and grow frustrated with it. As you know, the English language is replete with words that are derived from other languages, so I became frustrated with which words I could use, which words I should avoid. In the end, the only thing I avoided was to use terms they might not understand at the time. What this means is that Eve could not have talked about a “steel gray sky” because steel did not yet exist. She does use the word plagued because, although we relate that particular word to bubonic plague, there certainly were other plagues at the time—animal plagues, such as locusts, or biological plagues, such as sickness and disease. When Eve is in the Garden, she refers to Lucifer’s many colors in terms of precious stones, which she could not have known at the time, but remember, she is looking back on her life, after she has grown familiar with the precious stones introduced by the city people. 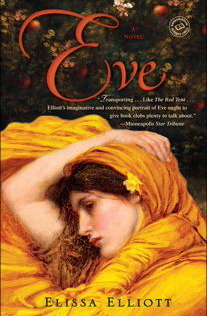 Eve’s voice comes from a culmination of sources—Job, certainly, wailing against Elohim’s injustice to him and his family; Song of Songs, yes, those wonderfully metaphoric ways of describing the marriage bed; and the Psalms, in which David begs for Elohim’s attention and mourns that his body is wasting away with grief. What are these Sumerian words–pukku and mikki and gidim? When Balili the priest tells Dara and the children about Inanna and the huluppu-tree, he says that Inanna made a pukku and a mikki for Gilgamesh who had saved her. Opinions range widely on what those objects were. Some conjectures: a drum and drumstick, a hockey stick and puck, or a ball and stick. Again, when Dara uses a word she doesn’t know—gidim—she likes the effect it has on Shala, her naughty little charge. What she doesn’t know is that the gidim were the Sumerians’ unburied and wandering dead.